Aly ready for a trail ride on Emma. Ack. That just about sums it up. So pressed for time am I, point form of the deadlines I currently face will have to do. The list should serve as an explanation as to why a) I am a lousy correspondent, b) this blog is so neglected, and c) I'm feeling panicky even though I don't drink much coffee any more. 1. Must finish sequel to Jo's Triumph. First draft of Jo's Gold is nearly done - small problem - I hate it. 2. Must submit Family Guide (for parents of very small - i.e. preschool - children) to the Royal British Columbia Museum. An exceptionally interesting project, and one that has helped with research for Jo's Gold, but extremely challenging. Just try distilling a whole museum into five thousand words or less. Extra challenge: some of your readers are still in diapers. 3. Finalize travel details for Iceland trip for new TV Show, Around the World on Horseback. Penalty for not getting this finished - no trip to Iceland. 4. Last reveiw due (waaaay overdue) for CBRA. 5. Island Parent Magazine column - deadline today. 6. Various publicity-related things in my capacity as Sono Nis publicist. Read Second Watch - it's good. 7. Final edits are done for the new Tarragon Island book (Trouble on Tarragon Island) but pressure is mounting to start work on a new book. 8. Submit content for Victoria Children's Literature Roundtable newsletter. 9. Edit/format/write (not necessarily in that order) the Bolen Books Bookworm. 10. Keep the animals alive - fed, watered, mucked, and exercised. 11. Keep myself alive - fed, watered, mucked, and exercised. Those are the highlights I'm dealing with today. There's more, but I don't have time to write them down. Colic is the number one killer of horses. But it looks like it didn't manage to do old Emma in... Whew! 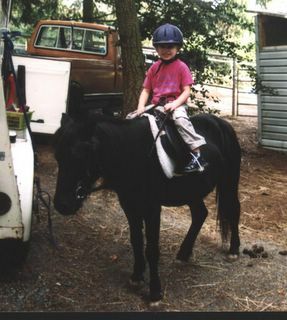 I do not know how I would have told my little niece, Aly, that her beloved pony was no more. But wow, what a gruelling and hideous couple of days it has been. It was pretty obvious this was a classic case of colic. Called the vet who came out and gave her a shot of pain killers and then Dani and I stayed up all night, alternately walking her and letting her rest. By 3AM the painkiller seemed to be wearing off and we had a phone consultation with the vet... continued the walk-rest routine all night. At 8AM the vet was back with another shot of painkillers and, since there hadn't been even a morsel of manure all night, the decision to do a stomach tube procedure. However, he only had horse-sized tubes and his partner is more the colic specialist, so we had to wait another four hours until the second vet could arrive. Poor Emma! After sticking a tube down her throat he let the excess air bubble out before pumping her full of mineral oil and water. If she felt gross before, she certainly felt rotten after that. More painkillers and an endless cycle of walking her for fifteen minutes and then letting her rest. We tried to tempt her with a little grass - nothing. Poor thing was totally depressed, her head hanging down (not a good thing as she was so backed up that the mineral oil mixture would start to dribble out her nose...). Dani and I set up camp again, this time with one proper bed in the tack room (the night before we had a pile of blankets in her stall and switched back and forth every fifteen minutes) and a corner with blankets in Emma's stall so at least one of us would be comfortable during our sleep phases. Since the vet said the process of clearing the impaction could last anywhere from a few hours to several days (!!!! ), we settled in for the long haul with longer shifts on duty and sleeping. Finally, at about 1AM, a dribble of liquid manure!!!! Then, another squirt and Emma took a bit of hay. Then, a gushing splurt (sorry so graphic, but why wouldn't I share?) and she had a drink. After that, every fifteen minutes she pooped a little more and ate and drank a little more. She has continued to improve all night and now (it's just after lunch), she is resting in her stall, a pile of respectable-if-still-a-bit-soft manure beside her. So, we hope the worst is over! We've come back to the house more than ready for showers and a hot breakfast and a pile of stinking blankets to wash. After a couple of nights like that I really have to wonder why I persist with this animal-keeping business. Needless to say, this is why emails and phonecalls have gone unanswered, work has been left undone. After finally getting things working (or so I thought) on the laptop, I started the Great Office Cleanup Project. I have been merrily emptying out several years' worth of ... stuff... from my little office (details and pix over on the publisher blog... follow link to the left), not worrying that my main computer was unplugged (after all, it was out of the way, my desk was slowly emerging from under the debris, and I could check my email). Hah! Turns out the messages that were arriving on the laptop represented only a random selection of messages that had been sent my way. Egads. My friend, Richard from Chilliwack, your note was one of those caught up in this dreadful state of affairs... Please accept this, my public apology. I shall sign off here and write to you forthwith. On a happier note, keyed in changes to the first 68 pages or so of the second draft of TI-3 earlier today. Some of the progress on this novel is being tracked over at the other blog (Journal of a Publisher and Children's Author - link over to the left). Since I am getting heartily sick of calling this book TI-3, or Tarragon Threee, or The War in the Tarragon Woods Except My Publisher Doesn't Like This Title So it Will Probably Change, if you are good at titles, please send me a few suggestions! Thanks in advance, oh wonderful titlers out there! It is pretty amazing how life just stopped there for a while. If anyone from CWILL pops by, the cheque is going into the mail... I promise. That is, right after I find my chequebook. Who writes cheques any more these days? I do humbly apologize for being such a delinquent member... If it is any consolation, at least half a dozen other organizations (SCBWI, Women Writing the West, the National Pony Express Association, the International Reading Association among them) also lapsed last year... 2005 promises to be much better. My dear mother is now in residence at a nursing home close by and this means I am finally getting back to normal - not that normal was ever highly efficient, but last year was quite extraoridinary in terms of its complete and utter chaos. Writing from Paradise - Literally! There really is no excuse not to write - I am being completely indulged at the moment. Diane of Sono Nis Press graciously invited me up to the Slocan Valley to stay in the writer's retreat at the most glorious spot in the valley - on Paradise Valley Road. So, I'm writing, working busily away on the first set of revisions to the third Tarragon Island book (thanks, Laura and Diane, for preliminary feedback!). Even more exciting (revisions could not exactly be called fun) is the early work we are doing on a new historical novel set in the Slocan Valley. For more information about this new project, click on the link over to the left that will lead you to a blog Diane and I will be keeping as we work our way from initial idea to arrival of book. Since Diane is far better organized than I am, there may actually be a chance that the publishing blog we do together will be updated on a regular basis (if only for Diane to say, "Nikki? It's your turn... again... still..."